BECOMING a part of the growing energy, oil & gas industry and cutting through the increasingly competitive markets takes carefully planned strategies to achieve targets. 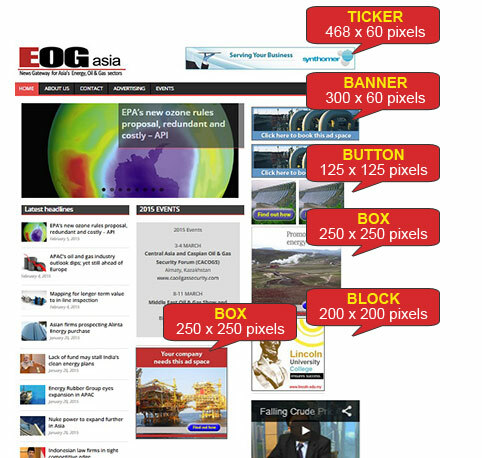 EOG-Asia has advertising solutions that we believe are parallel to your company objectives of increasing brand awareness and generating quality leads for your company’s products and services. We offer several online ad options to suit your requirement for online visibility. As a value-added feature, we include your ads in our regular e-newsletter sent out to our online mailing subscribers. We also offer e-broadcast services to help you reach your specific consumer base at affordable cost; ideal for events announcements, new products and services launches, membership growth, trainings and conferences updates and highlights, e-Broadcasts are delivered direct to your potential client’s inbox.